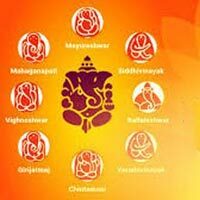 Itinerary for Ashtavinayak Tour From Pune . 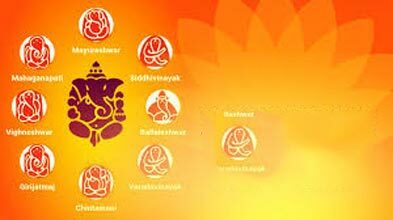 Take Mumbai Expressway to Khopoli (60 kms), visit Varadvinayak at Mahad (10 kms South of Khopoli). From Khopoli to Pali (42 kms) and visit Ballaleshwar at Pali. Take Road back to Khopoli and reach Pune back by Expressway. Pune Traffic is a real headache and so depart early for Ranjangaon (50 kms - 1 hour). Its located right on the Ahmedanagar Highway. From Siddhatek come back to Pune and overnight at Pune or Ranjangaon. Pune / Ranjangaon take route via Chakan. From Chakan, Narayangaon is about 50 kms and from there Lenyadri and Ozhar are both about 15 kms. So First head for Vighneshwar at Ozhar. By the time one is done with this temple its most likely that its afternoon and so head back for Pune.Air Fare, train.